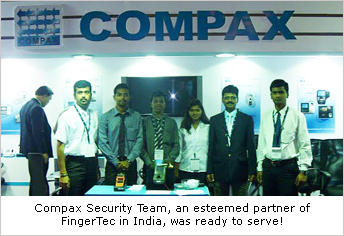 Compax Industrial Systems, India, participated in the recently concluded IFSEC 2010 held at Mumbai from 23-25 November 2010.Compax India, the Indian partner of Fingertec Worldwide, exhibited the entire FingerTec product range at the show with a bang. Unlike previous years, this time around IFSEC was held in Mumbai, the financial capital of India, instead of New Delhi, the actual capital of India. 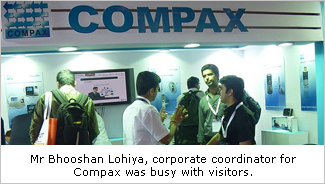 The proximity of the venue to Compax’s headquarters in Pune made Compax team went all out for the show. Compax showcased its strength as Biometric solution provider along with office automation and door access system in a booth size of 18sqm area. With an impressive set up, Compax presented a whole range of FingerTec product line along with other products that sync with Compax security department. A total of more than 350 enquiries in three days at the exhibition kept Team Compax busy throughout the show and post show also. The entire Compax Team is very optimistic that this exposure would create great opportunities in this New Year. “The primary motto for participation at IFSEC was to showcase nationwide our strength as a technology-driven solution provider and not only a product provider”, stressed Mr. Bhooshan. Mr. Sudhirkumar Dhawadkar, Sr. Manager Business Development, is quite confident about increasing the reseller network and cater to almost all parts of this huge market. To convince the visitors, Mr. Sudhirkumar, stressed the advantages of the Fingertec Micro-sites, Support related response time and the quality of the entire package. This eventful show marked the successful and growing association of Compax and Fingertec, which is 8 years strong. 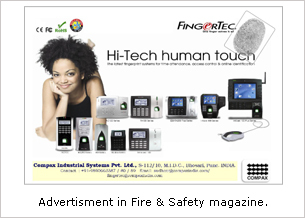 Apart from the participation in the show, Compax also released an advertisement in the official magazine for the show, Fire & Safety for better exposure. Compax has been participating in IFSEC for last 5 years and believes, this not only improves the sales but also helps in the growth of the brand, both Compax & FingerTec.